Cell Forté® w/IP-6 & Inositol / 120 Veg caps - Nature's Way®. Why have calcium, magnesium, and phosphorus been added to the Cell Forte Supplement Facts Box? Has the product been reformulated? The formula has not changed. Enzymatic Therapy, LLC. has chosen to include the calcium, magnesium, and phosphorus contributions from calcium magnesium phytate (the source of IP-6). These minerals have always been present in the formulation at the labeled levels. The federal regulations associated with the labeling of these elements are vague. A dietary supplement manufacturer is required to label essential vitamins and minerals “when added as a nutrient supplement, or when a claim is made about them”. 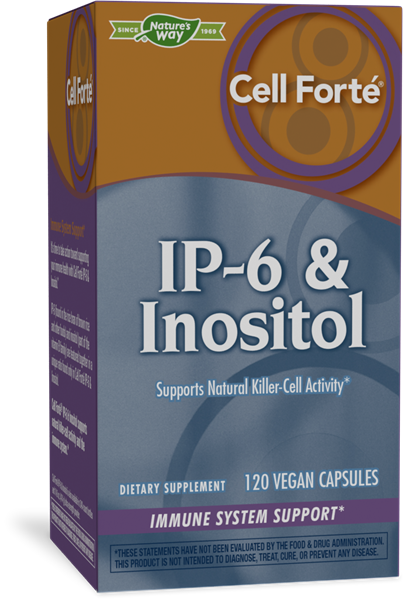 Since the product was formulated for its key components, inositol and IP-6, rather than calcium, magnesium, or phosphorus, Enzymatic Therapy had not included the mineral content on previous labels. However, we realize that our consumers recognize the wide range of health benefits associated with these minerals. Therefore, we have chosen to add the calcium, magnesium and phosphorus content to the supplement facts box.